Hello Everyone! It time for another challenge at Birthday Sundaes. This week our very own Michelle at My Passion for Crafting is sponsoring our challenge! 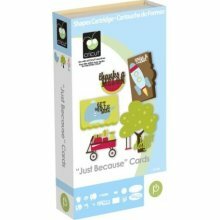 One lucky winner will win a Just Because Cards Cricut Cartridge! Thank you Michelle! The challenge this week is to make a Shaped Birthday Card! This is actually the second card I made for the challenge. The first was a boyish card and I needed a girly card for a party this weekend. I liked this one better then the other! I used my Gypsy to weld the two Raccoons together to get my shape card. I used Crystal Effects on the eyes and nose. My 3 year old put her finger in the one eye and nose before it dried! It still looks cute just a little flat now! Make sure you stop by Birthday Sundaes this week to check out the rest of the DT creations and link up your Shaped Cards by next Saturday for a chance to win this fun cartridge! This is so super adorable. I love it. beautiful! i have yet to make a shaped card with my gypsy. i'm so behind the times! maybe this week! Your card is super cute! !--Pat N.
I LOVE it! Cute bow in her 'hair'. So beautiful cat, card is lovely! Please stop over to my blog, I have an award for you to pick up! Adorable!! Love the fun shape! How cute! I love it... Create a critter is my favorite cart ever and I love to make those critters... this came out so pretty. What a cute little stinker! Love it! OMGosh Amber! This card is soo ADORABLE! Absolutely LOVE IT! I'm so glad to be working with you at Birthday Sundaes and now at My Craft Spot. This is just so cute, I love the doodling!